AS IT STANDS: Extremist Anti-Obama March Organizers Get Drunk - One Shoots the Other Between the Eyes! Extremist Anti-Obama March Organizers Get Drunk - One Shoots the Other Between the Eyes! It doesn't look like there's going to be a Paul Revere 2016 Final March to Restore America. Planning for a cross-country march to “restore America” — which is related to the Oregon bird sanctuary standoff — appears to have hit a snag when one of its organizers shot the other co-founder Monday afternoon during a drunken argument over a gun. 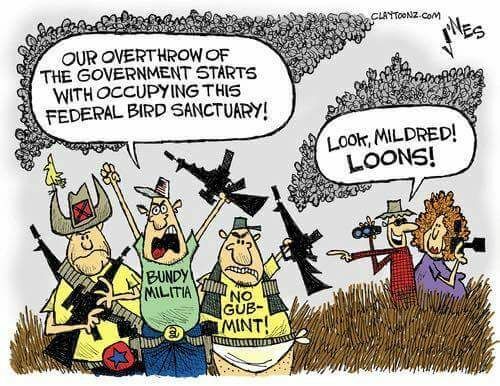 While authorities have been vague about the shooting, social media posts by right-wing “patriots” associated with militants occupying an Oregon bird sanctuary identified the victim and shooter as one of the organizers of a planned anti-Obama march. His name was Charles Carter. Bill Williamson, a right-wing “patriot” associated with the Oregon militants, said Carter was drunk and pulled Smith’s gun from its holster, but Smith drew a “spare gun” and shot his friend in the head (between the eyes to be exact). Think about that. These two gun-toting extremists were hoping to put together a coalition of crazies to travel across the country in a quest worthy of Don Quixote. Their goal? To make Obama step down from his job prior to the November elections. What on God's green earth makes those idiots even think something like that was possible? Vincent Smith, the guy who shot Carter, hasn't announced if the march is still on yet. I suspect he's lost any credibility he might have had among the "super patriots" and "3%'s."